What would you do with $1,500? If you had a $1,500 gift certificate to spend at a huge online bead store, what would you buy? Every kind of gemstone available? Enough seed beads or toggle clasps to last a lifetime? A top-of-the-line set of beading tools? I'd buy that–and more, but since I can't enter Bead Star (something about being the editor of Beading Daily), my big shopping trip will remain a dream. For you, this could be real. The grand prize winner in the Bead Star contest will get a $1,500 gift certificate for Fire Mountain Gems, along with a fun trip for two to Bead Expo in Santa Fe, New Mexico, and the joy of seeing his or her project on the cover of a magazine! And that's just the grand prize winner. There are tons of other big prizes too in every category: crystals, seed beads, glass, pearls, stones, metals, plastics, under $25, and designs with heart. There's even a prize for the bead shop that gets mentioned most often on the entry forms! New–A Special Prize for Early Birds! Yes, Marge—You, Too, Can Win! Have you been watching Dancing with the Stars? (Good for Priscilla Presley that she hung in there so long.) Or American Idol? (Why did they have to axe the Aussie?) Or Project Runway? (I could never make an outfit out of candy wrappers. What will they torture the designers with this season?) We love competitions and contests! And beaders, there are lots of contests out there for you to enter to feed your beading life. Interweave has a big one coming up–Bead Star! Our beading editors will select finalists, and all of you will choose the winners. And there are big prizes at stake, too. Does $5,000 worth of travel and beading supplies sound good? Follow entry rules to the letter! If there's anything you think is confusing or ambiguous, most contest sites offer FAQs. They probably even list contact information if you need more help. Don't lose by being disqualified. Get the best digital photo of your project(s) you can. If you've just made your most stupendously cool bracelet ever and you know it's a winner, remember the old adage: "A picture is worth a thousand words." Actually, edit that to read: "A great picture . . ." Loads of wonderful entries lose all the time because the image submitted to screeners and judges didn't do justice to the finished beadwork. There's even a Digital Art Photography for Dummies book to help you improve your results. Focus on finishing touches. Style and originality count big in contests. But be sure you finish your work beautifully with the best findings, technique (good tension, no knots or thread showing–unless they're intended, etc. ), and other bits of polishing. It's all about the total package. Enter contests frequently. Chance plays a part in winning, and you improve the odds if you keep on trying! As a judge, I've seen the bodies in the road, folks who could have been contenders but lost their way. There was the amazing crystal-embellished piece that was eliminated from a recent Swarovski competition because the entry photo was fuzzy and dark, making the piece look like one of those bad UFO photos. Or the extremely cool beaded shoe that had nothing to do with our Beaded Bag theme contest. Or a finalist piece of bead-woven jewelry with unruly (and unintended) threads sprouting here and there. For now, good luck to all. Ready? Set. Go! Visit the Bead Star website for a complete list of prizes and entry details. The deadline to enter is May 6, 2008, but if you enter by April 25, you'll be eligible to win the random "Early Bird" drawing. All beaders in the U.S. and Canada are encouraged to enter. Someone will win–why not you? Marlene Blessing is the editor in chief of Beadwork magazine and author of Create Jewelry: Pearls and Create Jewelry: Crystals. Marlene is an experienced beading contest judge and most recently helped judge the 2007 Swarovski Create Your Style Design Contest. Each month, an editor from Stringing, Beadwork, Step by Step Beads, or Step by Step Wire Jewelry will offer a free project of her own choosing! 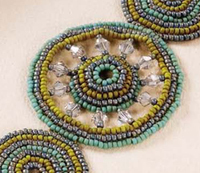 Today's project is from Marlene Blessing of Beadwork magazine. This sparkly bracelet uses circular square stitch to combine crystal bicones and size 11 seed beads in muted tones of chartreuse, gray, and turquoise. Originally published in the August/September 2006 issue of Beadwork magazine. Please note that this was a special limited time download: This bracelet project was free to Beading Daily members through June 1, 2008. Instructions are now available for sale in the store. Why did Marlene choose this project? She says, "Making square-stitched circles in really easy and fun. What's great about this project is how it teaches you that mastering one simple seed bead technique can allow you to design something satisfyingly unique. Try your own color variations–go for jewel tones instead of muted colors, or choose a citrusy variation (lime, yellow, and deep orange) for summer." Michelle Mach shares free beading projects and tips every Friday on Beading Daily. If you have questions or comments for Michelle (including suggestions for future free projects), please post them here on the website. Thanks!